On Monday 27 October Dr Clare Madge and Dr Jane Wellens presented their findings from the TEF funded project: Facebook and the University of Leicester Student Experience. Selina and myself went along to this well attended session. The team had examined how new students used Facebook before and during the early days of their time at University. Amongst other things they asked students what they thought about Facebook and if they considered it relevant to their studies or academic work. Their was discussion about how staff are using Facebook, for example, whether staff contact students using Facebook, whether they think it has use as a communication tool or has other academic purposes. I don’t have a copy of the slides with their findings, but from memory they found that large numbers (sorry I don’t know if the majority of not) of students had already got Facebook accounts before beginning University and had already made connections with others coming to Leicester well before arriving here in person. This was a new trend. Overall the students thought that Facebook was a place for socialising rather than for academic work. Some thought it would be a useful place to get notices (such as lecture cancelled). Selina – your memory is probably better than mine, so feel free to chip in here. A facinating sideline was the use of Twitter in the session. A live discussion paralleling the face-to-face took place where you can still read the debate that took place. The debate was even picked up by trendspotters and temporarily took discussion on McCain and Halloween of the top slots. Some ‘outsiders’ even pitched in. Using Twitter this way gave people a platform to have parallel discussions and put out their ideas about the topics being discussed. Unfortunately quite a few people (including me) found it hard to concentrate on all these threads at once, and I think the face-to-face discussion probably suffered as a result. Still, an interesting session. should students be given official University guidance on online identity and risk of self exposure on Facebook? the potential for Facebook for learning, teaching and support. are non English language students indirectly excluded from Facebook? Does its ubiquitous presence alienate them? whether staff should be Facebook friends with students. It’s a time of experimentation but many are warying of interfereing in students social space (which could kill the fun / dynamism of the space). All a bit creepytreehouse. Of course that doesn’t apply to our Facebook page as we are not intruding on anyone’s space, people are free to join or not. The existence of the now famous Leicester University Library Toilets Appreciation Society Facebook group is a fine example of grass roots feedback to the library. We have to know it is there of course to get the feedback. 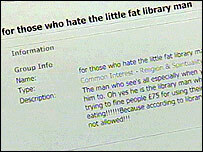 A less welcome version of the same mechanism is the case of bullying of a member of library staff at the University of Kent . OK enough of my ramblings, any thoughts? different citation formats for you (currently: APA, Chicago, Harvard, MLA, Turabian). Type in the title, author, subject, or isbn and it formulates the citation. you can only do one at a time, and from a UoL perspective it doesn’t cover the referencing styles we mostly use anyway. Still interesting to think of how lots of tools could enhance students studies. Any volunteers to write a Facebook application for our inhouse referencing styles?